The 9th edition of the Le Tour de Filipinas has been postponed because of the imminent eruption of Mayon Volcano. For the safety of the participants and everyone in the race entourage, organizer Ube Media Inc. has decided to reschedule the event at still to be determined dates. As of noon of Tuesday, the Philippine Institute of Volcanology and Seismology has raised the alarm to Alert Level 4 (danger on volcanic cone, caldera and all island — possibly of very large eruption and chance of flank eruption). The Category 2.2 race was scheduled February 18 to 21, with 15 squads, mostly foreign-based continental teams, participating. 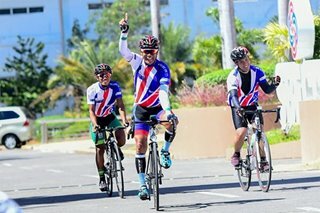 Stages One (February 18) and Two (February 19) were supposed to be held in two out-and-back courses in Catanduanes' capital of Virac. The other two stages were planned to stretch from Albay to Sorsogon around the Mayon volcano. The International Cycling Union has been informed about the inevitable postponent, as well as the teams, foreign and local, which have enrolled for the race.